"Sugar and Crumbs™ is a family run UK Company with a strong emphasis on convenience without compromise. We offer a range of 24 naturally flavoured icing sugars and 5 cocoa powders that are suitable for every baker at affordable prices. We pride ourselves on our uniqueness within the baking industry and our unrivalled flavour portfolio." So, how could I resist a tweet which offered some samples of such delicious sounding products in return for a blog post? I mean, that's what I DO! They very kindly sent Coffee-, Salted Caramel-, and Coconut-flavoured icing sugar, and a Chocolate-Coconut flavoured cocoa powder. In this post I am talking about the coffee and salted caramel. The first thing you think about is: why has nobody thought of this before? Ok, we all use vanilla extract or cocoa, or perhaps lemon zest in our buttercream, but this naturally-flavoured icing is so simple to use, it's quite surprising it's not more readily available. However, S&C seem to have cracked it. The flavour already integrated, you simply use it as you would normal icing sugar. With 1:2 butter: icing sugar ratio (as you do for the usual buttercream recipe) and a splash of milk, it turns out deliciously creamy and subtlety flavoured. 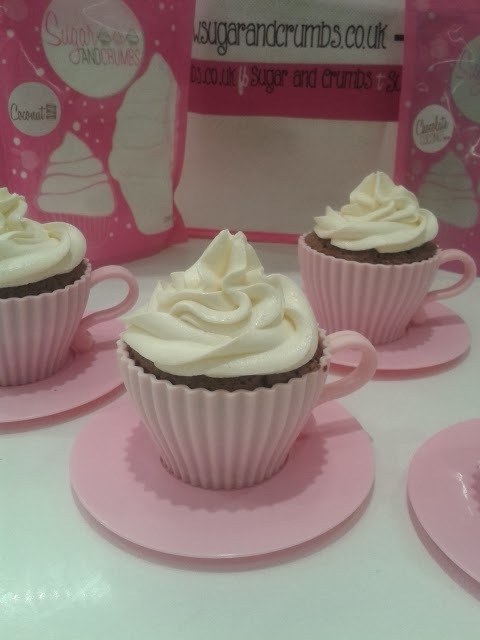 I made my usual chocolate fudge cupcakes, some in silicon tea-cups, some in regular cupcake cases. 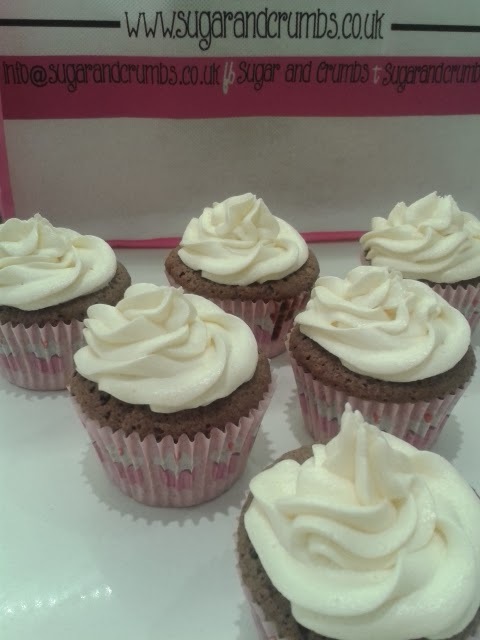 Using the coffee flavoured icing, I made enough buttercream with 125g to ice 6 (quite large) cupcakes. The smell while mixing was gorgeous, a real coffee cake aroma. Even if you don't like coffee, which my kids don't (that they know of, yet...), this flavour will appeal - my 8 year old loved it! My 7 year old, not so much, but she's not big on icing anyway. Both Himself and I thought it was sumptuous. Overall, I think it's an excellent product. Simple to use, and the flavours are strong enough to be identifiable, yet subtle enough not to be﻿ overpowering. You can of course used half flavoured, half regular icing sugar to reduce the strength of flavour (and make it go further!) but I think S&C have got it just right. Price-wise, it's slightly more expensive than normal icing sugar, but the packaging is excellent, and it makes flavouring your buttercream a breeze. For the variety of unique flavour available, I do think it's worth it, especially for that special occasion bake. 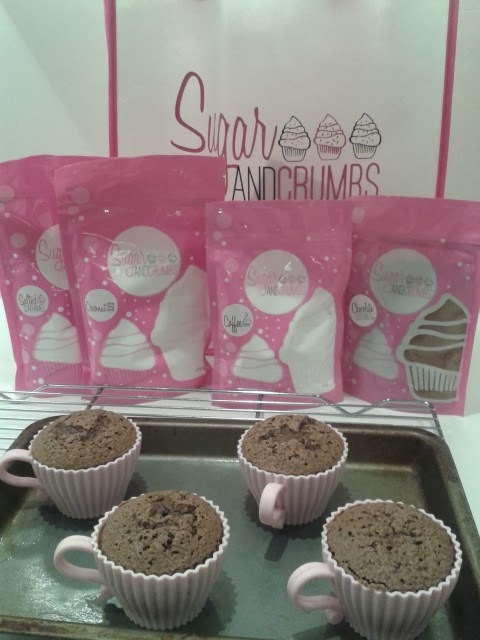 Big thank you to Sugar and Crumbs for sending me the products, and watch this space for chocolate-coconut cupcakes with coconut icing... I, for one, can't wait!